In every life everything happens for the first time, opened his eyes for the first time, the child sees the world for the first time hears the voice of mom ... There is a time and the number of "first" immeasurably increases, because the world is extremely interesting and his knowledge - is a long series of "first". The heroes of our articles - fun and excitement, serious and thoughtful, and calm Daredevil openers big world - children of employees of "KPI". 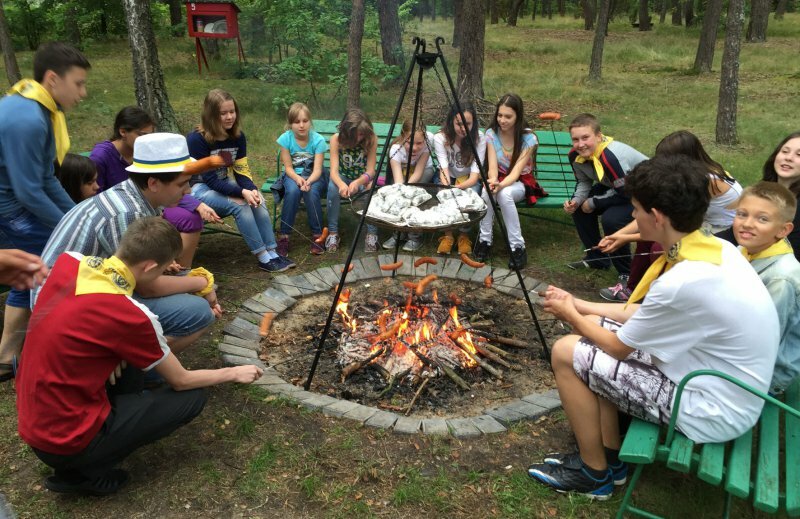 In recent years, has become a good tradition of joint efforts of trade unions and KPI Warsaw Polytechnics organize summer holidays for children in Poland. For most of our heroes of this trip was the first time this year. Like any journey, our began and ended at the central bus station. Kyiv. 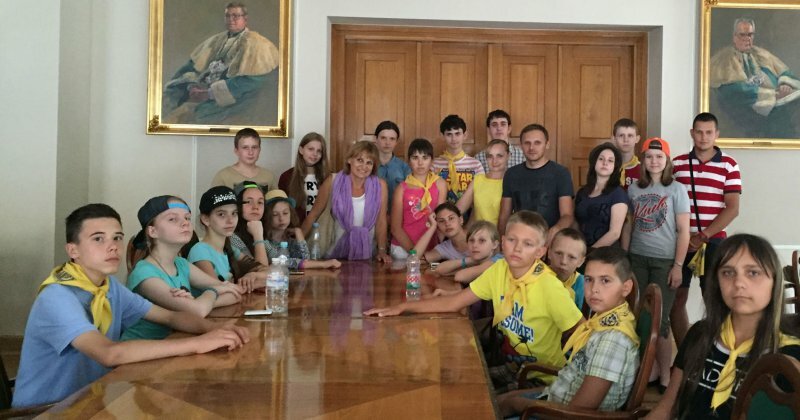 July 11, 2016 there were little groups, children with parents in anticipation of the meeting with Poland, worrying, getting final instructions and sideways looking at their future satellites. After 10 days, July 21, the bus took friends who together survived many interesting moments in the trip and hoped that the next meeting for continued dialogue and friendship. And perhaps also could it be otherwise? After all, they both "first" living in a student dormitory Warsaw Polytechnic, self-stamped tickets in Warsaw tram guessed the animal beloved Polish King Jan III Sobiyeski, walking in the rain and admiring the evening Warsaw. And how is this "first time" was 10 days travel ... But everything turns. Among the mandatory program prepared Polish colleagues were visiting the castle of the King of Poland Jan III Sobiyeski in Vilanova, a visit to the Warsaw University of Technology, Royal Lazenky walk the park, visiting the Museum of the Warsaw Uprising, the Warsaw zoo trip, tour the old city, climb to the observation deck of the Warsaw building Science and rest at the Warsaw University of Technology in Vilzi. The feature of this trip was an opportunity for parents to virtually travel with children, thanks to established social networks facebook group "KPI kids." It taught photos from all excursions, walks and trips, allowing parents to be aware of what they do and how to rest their kids: Photos of museums, palaces and parks selfie from the animal, swimming, boating, catamaran sailing and jumping on the trampoline, football , archery and horseback riding. Reviews parents were not long in coming: "How good that children don’t sit with phones on the Internet, and walking such a great place!" What brought on the trip? Photos on the background of attractions, experiences, emotions and gifts. Beautiful architecture and views of the Royal Castle in Vilanova could not leave indifferent our young visitors, largely thanks to an interesting style of Polish tour guide - constant contact with dit¬my through questions like "guess that for the time of year depicted in the film", "find sphinx in room decor "," do you think that is shown? " etc. And the children excitedly included in this game, which made the castle closer and more understandable for them. And what about pictures on the background of a peacock in the royal park Lazenky which, at the miracle dismissed his tail and strutted posing among architectural and natural wonders of this locality. Children's passion knew no bounds! Theater, fountains, romantic bridges, Chinese lanterns and much of what was seen, photographed and emotionally as told in answer to the question "What did you like?" And along with this serious Warsaw Uprising Museum - Displays of tragic historical events of 1944. Interesting and thought-style exposition made another visit to the museum an event long remembered children. They looked in every corner, gathered a collection of improvised calendar pages, depicting the events of each of the 63 days of the uprising, revised historical film about the sad and heroic events, walked catacombs and the then Warsaw, restored thanks to the technology of 3D modeling. Anyone found in this museum something close and understandable only to him. Warsaw University of Technology - majestic and beautiful building, speak about the history and modern technology which seamlessly combined to serve current and future students, teachers and researchers. Sitting at a table in the hall of the Academic Council, stroll the corridors, escape stairs to the top floor and look at the central courtyard of the building with height, sit indoors the selection committee with a serious view showing the brochure in "applicants" or search his name on the lists of students - is it possible to indulge in such pleasures? Then walk through the park, and forget about tiredness, ride on the swings and an exercise at the gym set nearby. Energy for our children can only envy, especially considering that the day they passed 10-15 kilometers during excursions and walks. Although there are kilometers and there is fatigue when you before the Warsaw Zoo and task managers - make your own photo of the animal. Said - done! The main question at the end of the walk was: "Did you see ...? ", And then the names of different animals, they were looking to see who and photographed. Even the rain did not become an obstacle for the mass of positive emotions, new experiences and enthusiastic shine in the eyes of his meeting with beautiful, interesting, cute and menacing the inhabitants of the zoo. As one of the girls wrote: "I got like a different world. Everywhere there were castles and churches!" (N.Reva). Top features of the next tour, held the old town, it is difficult to give. With that passion and desire to invent all concentration, touching the old bell and running around him to wish still true. The most difficult task was to choose souvenirs at themselves and gifts for friends. All considered, carefully selected and proudly show after purchase. And corrugations were delicious and ice cream, by which also could not be at tasting. Finally stay in Warsaw - up on the 30th floor of the House Science and look of this beautiful hill in Warsaw, looking for places where already visited and dreaming wherever else to go. And then things were going and was a bus transfer to Wilga, to the recreation of the Warsaw Polytechnic. Wood houses, peace and quiet ... Oh, no, there is peace, volleyball, tennis, football, badminton, cycling, going to the lake and visiting horse farms. And it was the fire, which own roasted sausages and disco. And sitting in houses, dialogue, debate and reconciliation in the game "Mafia", lost keys and walk in the rain. The more likes children - trips or camping - definitely not say. 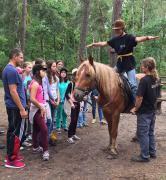 During the tour, they learn new things, see new sights, learned the world. In the recreation they learned themselves and those with whom fate brought them to these 10 days - learn to work in a team, help and support, to find a way out of controversial situations and actually socialize and have fun without the help of the Internet, movies and computer games. This is where most of them as friends, then home in Kiev, walk together to the cinema, to celebrate birthdays and continue to communicate outside of the summer camp. And as for me, this is great! Who can describe the experiences of children rather than the children themselves? The word our travelers. Daniel: "I first tasted corrugations, sailed on a boat, visited Poland, danced a slow dance. It was a wonderful 10 days!" Alex: "When we arrived in Warsaw, I most liked the Warsaw Uprising Museum and the Warsaw Polytechnic Institute. But when we got to the recreation center, I most enjoyed swimming in the lake." Maria Prischepa:"I first saw the red wolves. We Kyiv Zoo is a wolf, but gray, and these were red like foxes. Very big foxes! And I first drove the horse - he first walked, then ran trot and then gallop! It was incredible - if I jump on the trampoline. I then hugged and kissed the horse." Vladimir Borovitskiye: "We were cool tour! Great hiking! Good food! Cool travel and games were the best in the world! Thank you!" Anastasia Tutakova: ""This trip was the best for me. Thanks to some of my dreams come true. I found a lot of good friends and associates. Every day was full of events and really interesting. I became more independent and even improved health. For 10 days I experienced a lot of positive emotions. " Veronica Korol: "I was first in the camp. I really enjoyed it, I want once again with these same people spend as interesting time!" 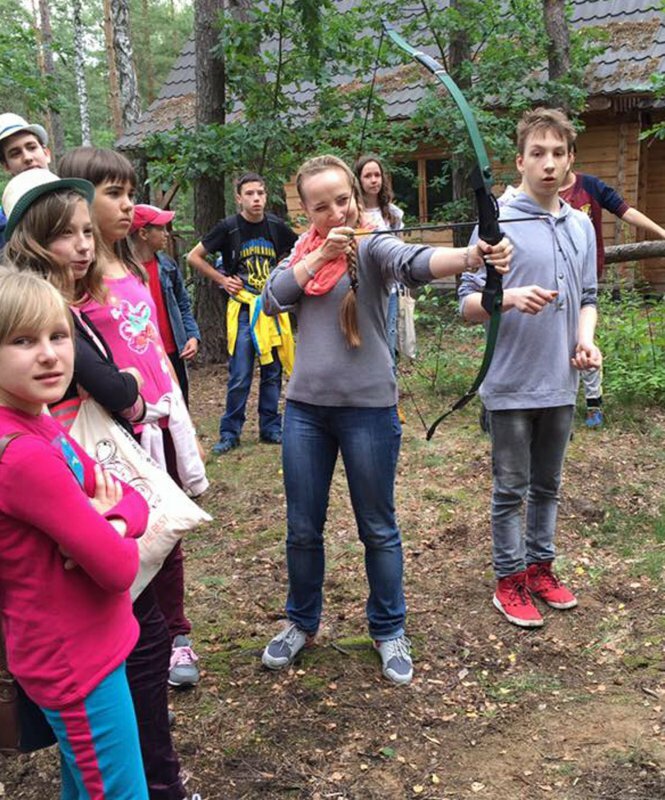 Elena Polishchuk: "My impressions of the trip to Poland, of course, positive. And how could it be otherwise, when I found new friends !!! I hope that we will communicate further." Anna Filin: "I'll start from the beginning, that is from your birthday. Birthday in the bus, I was not. I want to thank all the organizers of the trip primarily because they gave me so many friends. I think it was the best gift for my 14th birthday! every day we walked a lot, so were able to visit many beautiful places. of course, every day we came hungry and tired, but despite this we were happy that spent no time sitting at home, and walking in such a beautiful city like Warsaw. " Anastasiya Ignatenko: "I first saw the feed hippos and a peacock dissolves his tail. I also bought a lot of new for themselves product in supermarkets. And, of course, I was first in Poland, so first saw its streets and buildings. And finally: I first lived in a cabin in the woods. I really enjoyed this trip! " " Anya: "In this journey we seemed immersed in two parallel realities. The first 4 days we lived like kings, went on tour and saw a lot. In the other reality we lived in almost Hiking conditions. These two wonderful reality!" What can I say finally? 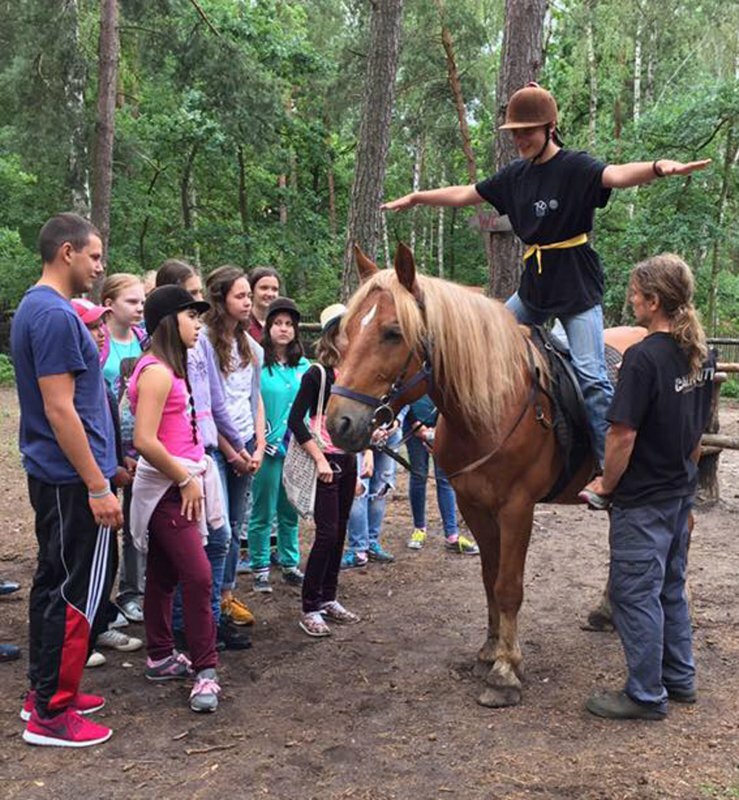 One can only wish the organizers of children's summer camps inspiration to continue this activity in the future, to combine the two countries and their people and give as much positive emotions and children who are discovering new and interesting, and adults who are happy watching them and seeing the shine and delight in their eyes! Vivat Polytechnics!